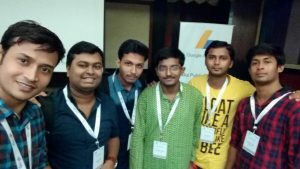 Google India organized an AdSense Publisher Meet on Kolkata on 4th August 2016. I was invited to the event, thanks to a friend of mine. I was very lucky to be one of the bloggers attending the Publisher Meet. Apart from learning useful SEO Strategies, we got to know a lot of other Bloggers from Kolkata, and had a good time spending with them doing fun. But well, I won’t go into those parts in this post. Here my aim is to deliver what I got to learn. I want to pass on the strategies to you, as recommended by Google, without any further modifications. Will Duplicate Content Penalize website? What is the optimum Keyword Density? So, keep reading to discover each and every aspect! I wrote this post in the sequence as set on the program. When you are reading it, think as if you are attending the program yourself and knowing these gradually. Note: What I wrote under third braces ‘[‘ and ‘]’ are my own words, just meant to illustrate the fact said. Other sentences are all directly conveyed by the speakers. India is a Multi-lingual country. Hindi is the most spoken language in India, followed by English (9 Million). Bangla remains as the third most spoken language in India (8.6 Million), Telugu in the 4th (7 Million). There are 354 Million Mobile Internet Users in India now. By 2020, 650 Million Indian Users will use Mobile Internet. Till now, people mainly from urban and semi-urban areas accessed the Internet. But in the upcoming days, people from rural areas will access the internet also. Till now, contents were written mainly in English. But as more and more regional people starts using the Internet, there will be a huge demand for contents in regional languages also. So, there is a huge scope for content creation in regional languages. Especially if you know regional languages, you can aim for creating a Hindi, Bengali or Telugu Blog. Create such influential contents where the audience becomes the brand ambassador and spreads it naturally in the social networks. There are 125 Million Social Media Users currently. Around 46% of them share contents across their social networks. So, that’s a tremendous potential. Q: As you said that creating contents in regional language has huge potential for getting discovered, well, I am a Bengalee, and I create a blog in Bangla. How am I going to monetize it? AdSense isn’t supported yet. A: Well, good question. I would like to say that we are planning to support more regional languages for AdSense. But we need more blogs on regional languages so that we can target advertisers for the same. The only reason regional languages are not yet supported on Adsense is that there is lack of content in that language. So, start writing on it, and use other ad networks for now. In future, you may see AdSense supported on your regional language. Smartphone Users spend more time on Apps than on Browsing Web. So, having a Mobile App for your website / blog is always a plus point to gain targetted traffic. There are 5 Stages you should consider while stepping your foot on Mobile App. Push Notification is an important aspect for any Mobile app to gain the user’s attention. 3 out of 4 Apps on your mobile are not used by you. We only use 25% of our installed apps. So push notifications are an important reminder to engage the person into the app. Progressive Web Apps are another approach. Example: Flipkart Lite. Progressive Web Apps provide an app-like interface on a mobile web browser. They can also be optionally added to home screen and directly launched. Often we just place ads randomly and not test the proper ad placement areas. There are usually 3 ads per page. Say first ad is on the top right sidebar of a blog which gets no clicks at all, the second ad is at the middle of the blog which gets the highest clicks and the 3rd ad is at the end of the content. When a visitor loads a webpage, the ads are called from Google Servers. The Ad with the highest bid is displayed at first, followed by the second and third highest. So, according to our scenario, the top right sidebar ad loads first with the highest cpc, but fails to get much clicks. Whereas the 2nd or 3rd ad gets more clicks. To solve these we need to rigorously test our ad-placement areas. On December last week you placed an ad on some position. On January first week you changed placement areas and measured your income from the two weeks. You saw your December Last Week Income is more. So you think that the December Ad Placement is the best position. But in reality, this may be false. Your January Ad Placement position may be better than December. Because, in both our tests, we didn’t keep ‘Time’ constant. In December, ads bidding rate is high. In January it falls. So, naturally, you got higher rates due to that fact. So, while testing an ad placement position, you need to keep the time constant. In other words, you need to run A/B tests parallelly at the same time. 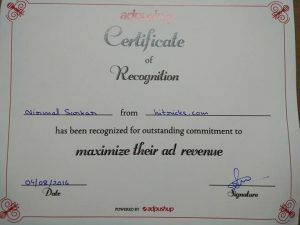 You can achieve that using AdPushup [adpushup.com], a tool guaranteed to increase your AdSense Revenue. Everything is automated there and optimized. You sign up, place ads, and it will auto-change positions in real time and find out the best position and keep it there. You can maximize your monthly revenue to a large extent using AdPushup. Q: Well, what is the pricing for AdPushup Service? A: We take a part of your AdSense Incomes. And it depends on the blog. We fix the pricing by directly getting in touch with the publisher only. There is not a flat rate as all blogs aren’t earning the same. And we don’t want to burden the bloggers. For example, Man goes to the hospital for kidney transplant, comes out as a woman. No matter what the topic may contain, every person who sees this kind of heading is bound to click and view it. Try to compile a cluster of subjects and write a list post based on it. For example: Ten Lies your doctor tells you. We trust doctors for our health. So, if we find out that even doctors tell us lies, then we will be keen to find it out. Write posts with ‘How to…’ query. They gets a lot of responses. Set up Google Alerts on your topic of interest. It will alert you about new stuff as it comes in the news. Set up LinkedIn Networking with thought leaders. They share interesting info on their networks. Feedly [feedly.com] and Pulse [linkedin.com/pulse] are two other sources for getting updated. Quora [quora.com] offers a broad range of topics which you can choose to write on your blog. Headlines and Meta Description are the only window to your content from search engines and social networks. So, the better you frame your headlines, the more views you will be able to get. Create unique and attractive headlines, to stay different from other sites and grab the visitor’s attention. They are very popular among visitors and have endless appeal. So no matter what happens, they will scroll till the 5th one for sure. Youtube has a significant potential as a traffic source that can help you earn lots. Write super-long video descriptions. Search engines like Google lean heavily on the text surrounding the video to understand your video’s topic. Use annotations to prompt users to be your subscriber or give directions. They can’t drive viewers to more content, increase community actions on your videos, and attract new customers. Leverage Online Communities like LinkedIn and Quora to provide an answer or a perspective using your YouTube video. Video Content Types: How To’s, Product Reviews, Collections, etc. People has lots of queries to ask, which is why they go to search engines for answers. FAQs on your site about various things can increase traffic to a great extent. FAQs should be well-structured and informative. Answers provided should be genuine. Useful answers will increase visitors’ duration, thereby helping increase the authority of your page and people will also tend to bookmark useful pages. Comments on Articles on Website or Social Media. Social Media Shares and Tweets. Duration of Stay on your articles. Conversions: Number of Downloads, Newsletter subscriptions, survey or poll participation, online purchase, etc. Find profitable niches and untapped keywords. Build Communities on Facebook, LinkedIn, Google+ Community. Give Freebies such as e-books to boost your subscriber list. Put some of your killer presentations on document sharing sites such as Slideshare. 40% Bounce Rate is the limit. You should not exceed that at any scenario. If your bounce rate is more, than you are doing it wrong. You can use Nabler [nabler.com] for accessing deep analytics and learning user behavior, which will increase your productivity in the long run. There remains an interconnection between Publisher, Advertiser, and User. The success of AdSense and AdWords is tied to the success of Publishers, Advertisers, and Users. What Measures are Taken by Google regarding AdSense Policies? Its the duty of Google to protect their ad network from invalid click activity, low-quality content, and other policy violations. There is a branched classification for the measures taken by Google regarding AdSense Policies. Site Warning is given for mild errors which can be easily resolved by the webmaster. Effect: 72 Hours are given to make changes, or the site is disabled. 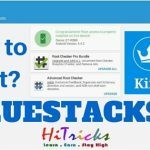 Site Disabling is done if the site is found to be violating adsense criteries with an intention to cheat / changes cannot be done on the site to make it correct. Effect: Ads are disabled on site immediately. Account warning is given if mild errors are found which can be resolved quickly. Effect: Make changes to prevent an account from being disabled. Account Suspension is done for a one-time serious policy violations which can be fixed. Effect: No ads will be shown for 30 days. Account Disabling is done if the account is found not complying with Adsense criteria with an intention to cheat / can’t be resolved. Effect: Publisher may not participate in AdSense at all. Permanently Banned. Always take prompt action on any Policy Notifications via email. We always say write quality content. But what is the exact definition of a ‘quality content’? How can you say that it is a Quality Content? Avoid galleries with no content other than compilations of images, videos or memes. Use a custom design for each site. Avoid using the same template for multiple, unrelated site. Ensure that users can clearly differentiate ads from Content. Ads should be placed on pages with precise navigation. Avoid placing ads on ‘Thank You’ or dead end pages. Publishers should not implement the ads in a way that ads might be mistaken for other site content, such as a menu or navigation. Publishers may only label ads with either “Advertisements” or “Sponsored Links”. No other variations are permitted. Publishers should avoid site designs in which the ads push content below the fold. These designs make it hard for users to distinguish between the content and ads. Publishers are not permitted to place ads on any non-content-based pages like thank you, error, login or exit pages. Invalid Click Activity consists of any Clicks or Impressions that may artificially inflate an advertiser’s costs or a publisher’s earnings, and for which we [Google] decide not to charge the advertiser. The only way to fix is to identify which traffic source your click is coming from and blocking it. Use custom channels to identify specific parts of ad traffic and monitor their performance as compared to other ad units. Use URL Channels to track how your ads are doing on different parts of the site. To ensure better reporting on specific campagns use custom URLs in the newsletter or G+ page. If your AdSense account has policy violation then you shall be able to find a red bar on the Homepage of your Account as well as email. So far the most interactive and informative session was from Mr. Bakshi, who alone gave us back to back awesome information for SEO and clarified all our doubts. Read this part very carefully. You will understand the search engine behavior from the root. And it will help you a lot in SEO. I can guarantee you that you shall learn something new from this section at least. Robots.txt sets the behavior for search engine bots. It instructs the search engines whether to crawl a site or not. A text file where you can write rules for search engines about which parts of your site they may access. Not necessarily all search engine bots will respect the instructions set by Robots.txt, but good bots like GoogleBot surely does. Having Robots.txt file on your Blog is not compulsory at all. In fact, it is recommended not to keep any robots.txt file at all if not required. By default, Googlebot will index your website if you don’t have a robots.txt, but if you have a misconfigured robots.txt file, then Googlebot can’t read it, and it abandons indexing your site altogether. So, better not to keep a robots.txt file than having a misconfigured file. The latter can be harmful to your blog, and your blog may not get indexed at all. You publish content with a headline and meta description. GoogleBot reads your robots.txt file. If your site is blocked by robots.txt or not accessible, GoogleBot quits your site. If your site is available by robots.txt or there is no robots.txt file at all, Google tries to crawl into all the pages of your website. After all, your webpages are crawled by Google; it instructs GoogleBot-Mobile to crawl the webpages for the mobile version. After crawling for all pages is done, Googlebot indexes your links on Search Engine. These are the 7 stages for your website to show in search engine. If your blog has multiple languages or runs on regional languages, you need to take care of it so that your site shows up on Google. An Open Source Fonts Engine is Google Fonts. You can use that to write your fonts in any language and then use it on your site. It is based on Unicode font and guarantees your site will be crawled by Google. Optimize your site for human fingers (Tightly Packed Links are hard to touch on small screens) 7mm (or 48 CSS) is a safe space to maintain in between clickable links on mobile web. 5mm is good for footer links which do not get clicked often. Use default browser CSS line-height of 1.2 cm. Don’t Block Resources [JS/CSS etc] If you block resources like JS/CSS, your site UI may break. Also, Google can’t determine whether your site is mobile friendly if you block them, as the mobile friendly codes are added as resources. Till now there are 130 trillion webpages indexed on Google. And it was found that about 60-65% of the content are duplicated content. So, should Google penalize 60% of the worldwide web? Nope. Don’t worry about duplicate content within your site. Neither. It won’t help, nor it will harm. All Google Products are independent of each other. They are made to help us. Again, there are other products outside of Google which are unique too. Use whichever product is best suited for you. Your site won’t be boosted on Google, neither will it be harmed if you use Google Products. No. Pagerank is neither dead nor everything. PageRank is the measure of the quantity and the quality of links to a page. Many people consider that in 2016, Pagerank is no more a ranking factor. Google still uses Pagerank an important aspect for ranking. But at the same time it should be kept in mind that Pagerank is not everything. There are 200 of other ranking factors responsible for it. It’s a big No. And in reality, there is no term called Link Building. Ideally, we should not create backlinks for our content. It should occur in the opposite direction. If other bloggers find our article good enough, then they should link it back from their sites. This is a natural linking. We all do blog commenting, guest posting, etc. all of them are wrong ethically. It changes the meaning of backlinks entirely. I [Mr. Bakshi referring to himself] don’t know who taught this SEO fact initially, but this rumor keeps on spreading from one person to another. There is no term such as Keyword Density. Its coined by some so-called SEO Gurus. Is Google a Machine or a Robot that you fix a density of keywords and expect your posts to get ranked? Suppose you are reading today’s newspaper. You find on an article some keyword is repeated again and again in every line. You will lose interest and become frustrated. Don’t write for bots. Write for humans. Your flow of writing should be natural. Then check your keywords later. You can also use synonyms to your keywords. Not all people browses the same thing. Including more and more keyword variations will increase the chances of your content to get discovered. Focus on content. Focus on Brand. Focus on your Audience while writing your post. YOU MAY ALSO LIKE: 10 Tips to decorate your blog post? The reason is that Google never looks for similar sites hosted on same IP address while ranking your article. In fact, it does not look at all pages of your blog at all. So, even if you are in a shared environment and one of the sites on that shared ip is non-compliant with Google, it won’t have any effect on your site. In fact, Google does not require your sitemap for indexing your website. Still, they recommend you to submit you to submit your sitemap so that it understands your site structure better and can crawl your site without errors. Sitemap helps Google to find all your published posts and upcoming posts so that it can come and crawl it. If there is an error in the sitemap, it will notify you in webmaster, but rest assured, it won’t harm your rankings on Google. Googlebot will still try to crawl and index your website. YES. SSL is important and stands as a ranking factor as well. Many people thinks SSL is only required for sites dealing with sensitive or private information like Credit Card details etc, but well, it is also very important for all other general websites as well. SSL is necessary irrespective of the type of site. Without SSL enabled, hackers can gain access to the behaviour of your visitors like where they are coming from, where they are going, which ads they prefer etc. To protect this, you should add SSL. SSL is the future of security. Every big website is moving towards SSL you should also think about it and switch to SSL if you haven’t yet. Will any SSL Work? Like Free SSL from Cloudflare? What free ssl like cloudflare does is it creates a boundary between your visitor and your server. Your server to Cloudflare boundary (that is the backend) is not protected by ssl. But cloudflare to the visitor (that is the frontend) is protected by ssl. And it works equally well. Only the frontend where the visitor is interacting should be SSL Protected. And any SSL provider which can protect it should function without any issues. Suppose My site goes down for a day without my notice. Will I lose SERP? Why do you even think about it? Think only of your website. Try to fix it asap and bring it live and forget other stuff. For crawling, indexing and ranking, Google is there for you. Don’t worry about it. If you write quality content, you are bound to get ranked. Another blogger shared his experience of facing downtime for 7 days continuously. Still, he made that live and worked on it, and it got back its position. So, I guess the answer is ‘yes’ though they didn’t specify it directly. Well, we have almost reached the end of the article. Here I am giving you some official Google Webmaster Help Forums and communities recommended by Google. I want to thank Google India a lot for giving me an opportunitity so spend some hours with them and discuss the best SEO Practices and getting actionable tips from them directly. 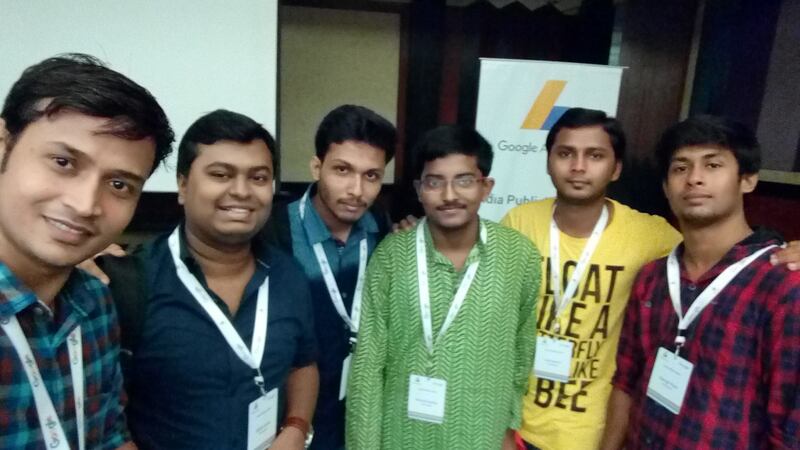 I am happy to be a participant of the first ever AdSense Publisher Meet organized in Kolkata. They never organized any Publisher Meet in Kolkata beforehand. The event ended. We were very happy to meet with other bloggers from our city and networking with them. The other Google Employees were also interacting with us and assisting us well. 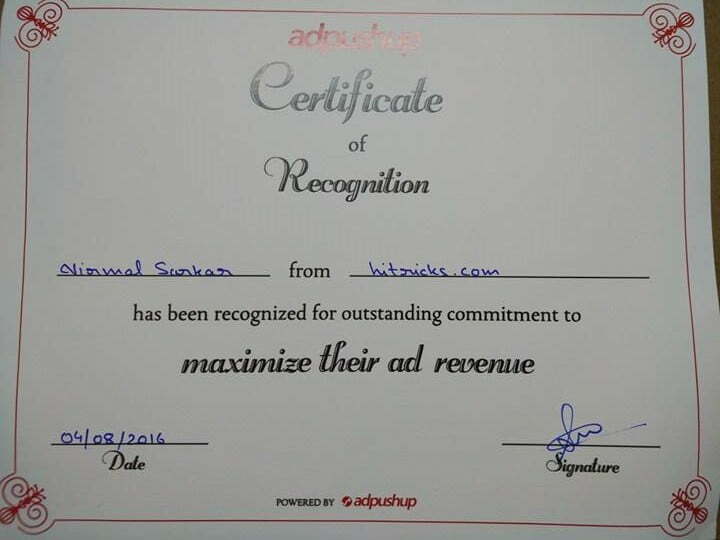 We received a certificate of recognition from AdPushup. We also received a Book on “Google AdSense Revenue Secrets Revealed“. The book contains fantastic information regarding Google AdSense and has actionable tips to improve your Ad Revenues. I made the book available for you all as a soft copy ebook in pdf format. You can Download it from below. 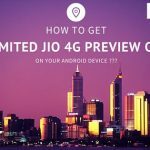 YOU MAY ALSO LIKE: How to Get Reliance Jio Preview Offer on your Android Device? This Ebook is published by AdPushup team. Go check it out. You can either Download It or Read Online, whatever you wish. That’s all. I tried to recreate the day to the best I could. I think it was an amazing experience for you all reading through the lines. Thanks for reading my article on Google Adsense Publisher Meet, Kolkata. It was held on 4th August 2016 at The Park Hotel. Do comment your feedbacks below. I am eager to read it. See you soon with something interesting. Till then have a look at my other articles. 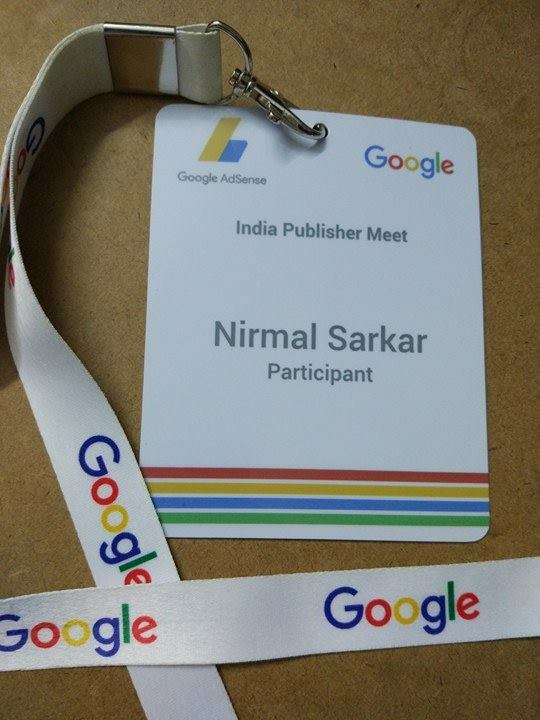 I was a Participant in Google Indian Publisher Meet 2016 Kolkata. It was really awesome and helpful. Thanks for sharing all the details very carefully Nirmal ! Thank you for each and every aspect of the AdSence publish meet. While reading this I felt as if I am attending the meet too. Thank you for helping to update my knowledge by this amazing article. You gave me lot of information. Thanks for sharing. Inspired after reading this. Thanks for sharing the amazing stuff! But, is it still working? After fred update? Thanks nirmal bro to give all information by recreating that day. Got to know amazing facts related blogging,adsense. We are publisher of google so getting answer from google officially about our query is totally valuable. Thank you again. Thanks for sharing your experience, Amazing..
Hi, once you get approved for a site, you can use the adsense codes on other sites of yours without any approvals. Your competitor is doing the same. They got approval for a different site and using the code in the site you mentioned. I suggest you do the same. Your niche sites won’t get approval from Adsense easily. Make a normal niche blog with valuable contents and apply for adsense, get approved and use that ad code in your site. Hope this helps. Thanks. Great coverage. Last year i also attended the publisher meet in Gurgaon and shared some views on shoutmeloud but you did a deep explanation with references. Very helpful and love it. Thanks nirmal to give all information by recreating that day. 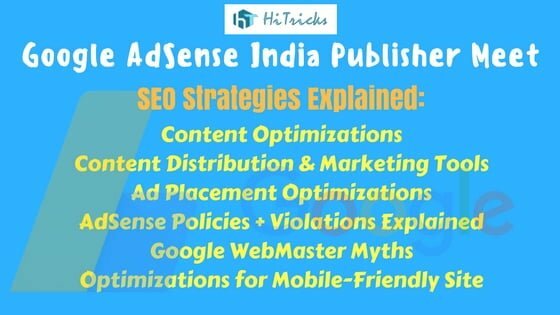 Got to know amazing facts related blogging,adsense. We are publisher of google so getting answer from google officially about our query is totally valuable. Thank you again. Really great article bro. Thanks for the article and time u gave to write this article! This was the awesome article…..it cleared most of my confusions. Keyword ensity doesn’t matter which most of the bloggers practice. Here is the myth cleared. Thanks again for coming to HiTricks and Reading the article.